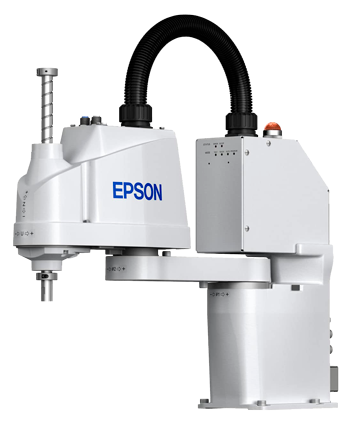 With a keen focus on ease of use, performance and reliability, Epson is a leader in the Articulated 6-Axis Industrial robot world. Having led the robot manufacturing field with one of the first PC based controllers, Epson was the first to then offer Active X Controls (.NET support) to allow easy integration of 3rd party products into robot workcells. Epson’s focus has been to keep things simple and easy to use. Ask for a demonstration of the EPSON RC+ Software and you will see for yourself that they remain on track. The T3 SCARA is the most cost-effective SCARA robot, ideal for pick and place applications, even as it leads the field in terms of performance and reliability. To the SCARA line-up, Epson adds multi-axis and modular products that lead their respective fields. For the tightest budgets requiring high product yield, Epson has robots which when coupled with their high performance controller and Open Architecture PC based controller, deliver extraordinary ROI even for the most complex applications. Superior results start with excellent products, but then require a matching commitment to excellent support throughout the life of the product. We would appreciate the opportunity to show you the level of service that leads many of our customers to describe themselves as "raving fans." HTE Automation is your choice for rapid ROI on Epson Robot automation projects in Kansas, Missouri, and Illinois.